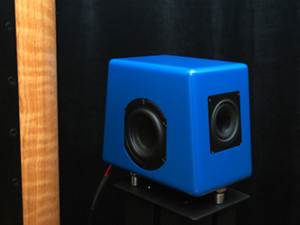 John McDonald’s Audience company has developed a range of speakers using a proprietary 3” cone driver to cover the complete audio range. The flagship Clairaudient 16+16 ($72,000/pair) made its debut at the Newport Beach Show. Each Clairaudient 16+16 uses 16 of the latest-generation drivers firing to the front and another 16 to the back, and is specified to be flat to 30Hz. The speakers were driven by Audience’s prototype Wavepower 100W class-D monoblocks, the Audience Wavemaster preamplifier, a Manley Chinook phono preamplifier, Oppo and Bryston digital sources, and a modified Denon turntable with Audience tonearm wire and a Lyra Delos MC cartridge. 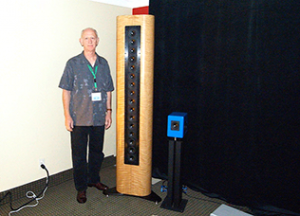 Cables, of course, were all Audience Au24e, and AC conditioning was done with an Audience Adept Response aR6-TS ($6000). No subwoofer was used at the Show but Cyrus Chestnut’s piano on Revelation had weighty low frequencies and a natural tonality, with a big stable soundstage. The small blue speaker in the photo is the Clairaudient 1+1 ($1800/pair), which uses just one drive-unit front and back, with passive radiators on each side, and sounded very much larger than looks would suggest. Posted in THE Show Newport 2012, Tradeshows.